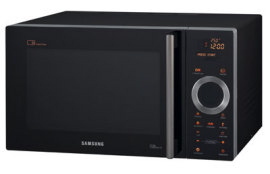 It won't make you a top chef, but if you're constantly under nuking that bag of popcorn, Samsung's new microwave can help. The Smart Oven is capable of reading the barcode on prepackaged foods and automatically calculates how long to nuke your meal. No word on whether its library of barcodes can be updated or not, so you might want to think twice before committing yourself to a life of popcorn and frozen fish sticks.